Take the Waterfront Trail from Hamilton along Lake Ontario. Visit the Waterfront Trail website. Follow the Trans Canada Trail or the Waterfront Trail along Lake Erie. Rainbow Bridge: Follow along the regular city streets and enter the bridge with the automobiles. Queenston Lewiston Bridge: Enter the bridge entrance on the ramp closest to the Mount St. Mary’s Hospital. While crossing either bridge, cyclists are asked to ride on the roadway deck along with vehicle traffic, wait in line to be processed by Customs Officers and then proceed onto the city streets. Take note there is a charge of $0.50 per bicycle when entering Canada only. For more information visit Niagara Falls Bridge Commission website. From the US, access the bridge by using the south sidewalk which is located by entering the Peace Bridge parking lot off of Busti Avenue. At the end of the parking lot enter using the turnstile and cross the bridge. Take note that bicycles must be walked across the bridge. At the end of the sidewalk follow signs and use tunnel to cross to north sidewalk. Proceed down the sidewalk to the building entrance marked “Pedestrians/Bicycles” for inspection. This bridge is toll free. Visit The Peace Bridge website for more information. Located 1 1/2 hour drive from Toronto, merge onto the Gardiner Expressway West then taking the Queen Elizabeth Way (QEW) and following signs indicating Niagara/East Hamilton/Fort Erie. Crossing any of the 3 main bridges, Queenston Lewiston, Rainbow Bridge and Peace Bridge will bring you right into the heart of the region. Visit the Niagara Falls Bridge Commission for border crossing wait times. Note there is construction on the Peace Bridge and is closed to cyclists until Spring 2019. When arriving by plane either in Hamilton, Toronto or Buffalo, New York, Niagara Airbus will drive you to your accommodations. Visit Niagara Airbus for more information. Full schedule and fare information available on GOTransit. Listed below are the public transportation companies servicing the Niagara Region and certain municipalities. The following public transportation companies have bike racks on their buses, except for the Welland Transit system. GO Transit – Offers GO Bus transportation to the Niagara Region. Visit the GO Transit website for fares and scheduling. Niagara Falls Transit – Servicing the City of Niagara Falls. Visit the Niagara Falls Transit website for routes, fares and schedules. Niagara-on-the-lake Transit – Servicing the Town of Niagara-on-the-lake. Visit the Niagara-on-the-lake Transit website for routes, fares and schedules. St. Catharines/Thorold Transit – Servicing the City of St. Catharines and the City of Thorold. Visit the St. Catharines Transit Commission website for routes, fares and schedules. Niagara Region Transit – An inter-municipal transit service connecting Niagara Falls, St. Catharines, Welland, Fort Erie and Port Colborne. Visit Niagara Region Transit for routes, fares and schedules. WEGO Transit – The WEGO Transit system connects accommodations and Niagara Falls tourist areas and attractions. Visit the WEGO Niagara Falls Transportation website for routes, fares and schedules. Fort Erie Transit – Servicing the Town of Fort Erie. Visit the Fort Erie Transit general information page for schedule, fares and schedules. Welland Transit – Servicing the City of Welland. Visit the Welland Transit website for routes, fares and schedules. Take note the Welland Transit system does not have bike racks on its fleet and also does not allow bicycles on the buses. uLinc – Servicing the Town of Lincoln. Visit the Town of Lincoln website for routes, fares and schedules. Port Robinson Ferry Service – accessible passenger service carries thousands of cyclists, pedestrians and local residents safely across the Welland Canal. It allows a shorter route to the Niagara River, connecting the Greater Niagara Circle Route. Learn More. Download these cue sheets below for step by step guidelines to get from the Port Robinson Ferry to the Niagara River Recreation Trail and back. Total of 22.9 km one way. A shuttle service by taxi or mini-van can be provided depending on the number of passengers, to move bicycles and cyclists throughout the Niagara region. Coventry Transportation – Well respected for its high standards, excellent governance and efficient support infrastructure needed for moving people safely. 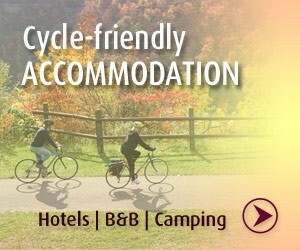 Accommodating multiple passengers and bicycles by providing van shuttle services. Central Taxi – is an authorized taxi company serving customers throughout the Niagara Region. Providing taxi, car services, charter bus services. The Taxi APP – we recommend downloading the app before you begin exploring Niagara. You can rely on Central Taxi services should you encounter unforeseen problems along the way. When reserving a taxi pick-up location make sure to mention that you have a bicycle. Simply send your text message to: 905-685-7343. Telephone: 905-685-7343 or book online through Central Taxi website. See Bicycle Rental and Repairs under Resources. Visit the Niagara Regional Road Projects website for up and coming construction projects. Also visit the Ministry of Transportation of Ontario (MTO) Traveller’s Information Services (511) for up to date traffic reports in Niagara.